That may or may not help here but he didn't call or e-mail back so I believe the test drive sorted it. It was unknown if the rack was original or replaced in this case. I'm not quite sure if any Ross tech employees found a solution. I took it to a shop and they didn't even know how to do it with VCDS. We did some more testing on this in October and I don't think we've had a chance to detail a procedure yet but I will see what I can find. So I've been waiting for several months to see if anything was ever posted about the correct steps to take. I've taken my car to two VW specialist centers with VCDS and neither of them knew what to do to clear steering end stops fault. I still have it. Any updates Andy? Slowly turn the steering wheel to the right and left, passing the index mark (approx. 45°) until all 4 slope detection indexes have been recognised (detected) and the index mark is set to (1). - Turn the steering wheel slowly to the right and then to the left mechanical stop. Note: in a test on the car it never showed permitted in either of those? Wait for it to show Finished correctly? Note: in a test on the car there were no faults and no warning lamps. Turn the steering wheel to the right end stop. Turn the steering wheel to the left end stop. Turn the steering back to its center position. Check the yellow fault lamp on the dash. The fault lamp on the dash must go out. Last edited by Andy; 09-12-2018 at 04:10 PM. We've had some customer inquiries about this so I was able to induce a fault in my 2015 GTI in 44-Steering Assist and was able to clear it using the following steps. Next, I went into Security Access -16 and entered the code that shows up in the little helper balloon and it was accepted. Here's the weird part, it showed "Running" but never changed from that. I left it in this mode for 60 seconds then clicked on [Stop] and [Done, Go Back] and [Close Controller, Go Back]. Next, I cycled the ignition off and back on again. At this point, the TPMS, steering wheel, and ESP lights were still lit up on the dash but a brief drive through a parking lot made them all go away. this baloon does not show up when i hover over it in vcds,so i dont know what the security access code is??????????? You click the button [Security Access -16] in which Control Module ? Try again in Steering Assist-44, it should pop-up. Tried this tonight remotely with someone and it worked. 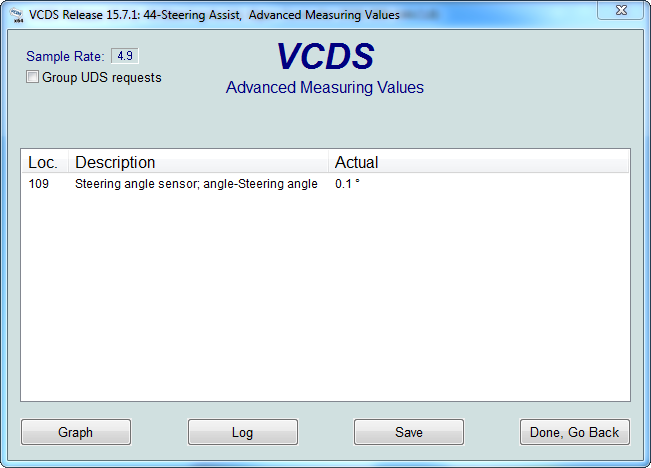 When doing the Basic Settings [MAS00815] Steering angle sensor, did it ever go to "Finished Correctly"? We have been testing this test plan last night and this morning on different vehicles within the Ross-Tech fleet, but these have all been vehicles in proper working order. Rotate steering wheel 90deg left then center, 90deg right then center so steering wheel is level, front wheels pointed straight ahead. Rotate steering wheel all the way to the left, hold firmly against end stop for 5 seconds. Rotate steering wheel all the way to the right, hold firmly against end stop for 5 seconds. Center steering wheel, front wheel straight ahead. Note: our testing of this would still be "Running", never got a message of "Finished Correctly"
Now a bunch of error messages and warnings will appear on the cluster, what messages you get can vary based on how the vehicles is equipped. Now most warning messaged in instrument cluster should be removed. Cycle the ignition off for 10 seconds. Several other control modules will flag DTCs, "Databus" type codes that can now be cleared out. 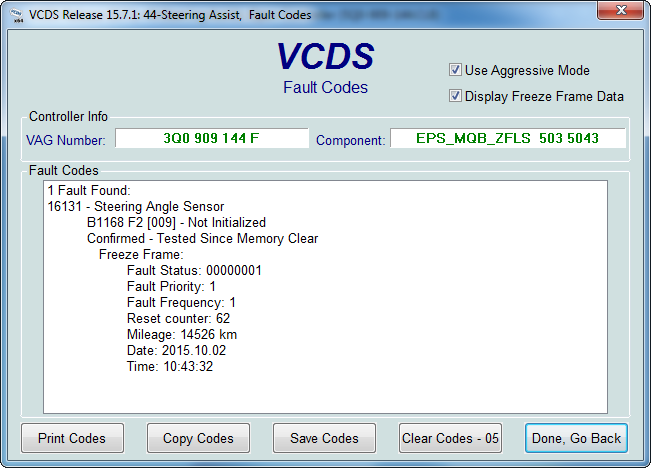 Again, we are doing this on vehicles that had no fault codes to begin with. We have a Finished Correctly! 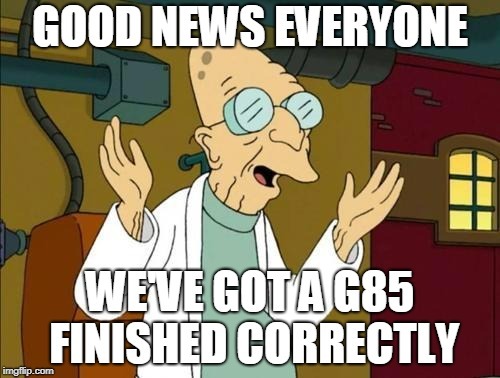 Atlas that actually had hard codes for the G85. Last edited by Jef; 11-02-2018 at 08:54 AM.